When it comes to landscaping there is a lot to consider. I have put a lot of thought into thinking about landscaping. While it may seem amazing, after building a house with my husband I have never got around to landscaping around my house. There has always been a lot of other things to do and spend time and money on. Well, this spring I am changing that. I want to share my plan with you and help you think about what you can do with your space. My main first concern is making sure that I keep the gates shut and not allow the sheep and geese around my place. There is a whole world of cabbage out there and some are quite beautiful. Purple cabbage and Savoy cabbage make a pretty contrast to one another. You can also mix in some of your traditional varieties like Early Jersey Wakefield or any other favorite. Cabbages do require some room to spread out. You can have a lot of cabbage for your favorite fermented foods. My dad likes Kim Chi and you might too! There is little stopping you from planning your cabbage landscape with your favorite fermented things in mind! 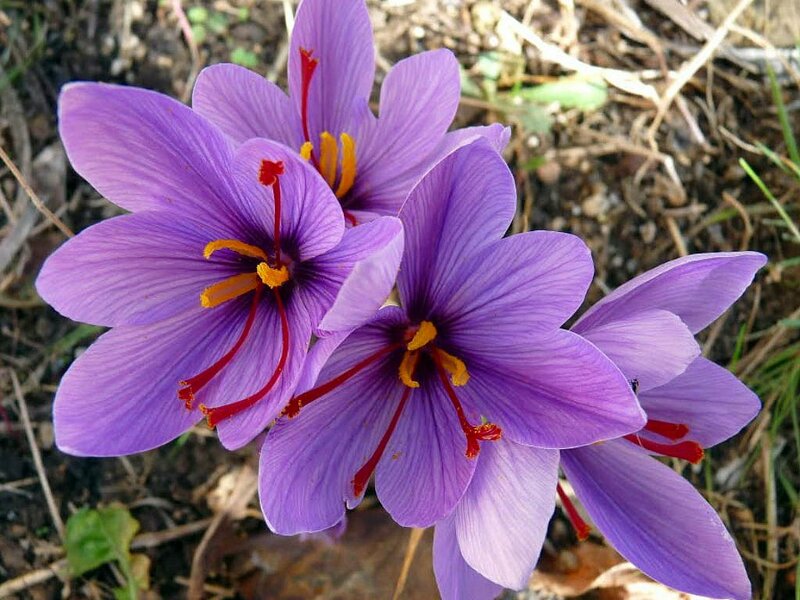 The saffron crocus is gorgeous and produces some very expensive stems. Saffron is important because it adds a lot of Vitamin B to rice and thus prevents vitamin deficiencies when you have to eat a lot of rice. Combined with the arsenic issue with rice, it is easy to see why one should make their own yellow rice instead of buying the packets where if you rinse to remove arsenic you are taking away all the spices. The bulbs are not expensive to buy and you can expand your patch yourself over time. I love growing garlic. It is very pretty and you can get greens off the top as it grows. Garlic scapes are so good. You don’t want to cut them too much though or you will be in the position of stunting your growth. Seed garlic can be kept year to year if you are careful to dry it out well. Only keep the biggest bulbs for replanting. Using smaller ones will result in small garlic whereas using your best will improve your crop. Some people swear by the seed garlic that you buy specifically from a farm or garden supply. It is quite expensive compared to what you pay at the grocery store but you are able to get specific varieties which can be fun. Also, consider that if you pay for the exact varieties you want it is a one time expense if you keep some bulbs to replant every year. Of course, you may have a bad season or just want to have a bigger better faster and thus order more. Ordering 5 lbs or more of seed garlic results in a better deal usually so if you have friends that want to grow, consider going in on a bulk order together and stretching your gardening dollar a little more. These greens might be in a container but you can see how beautiful they would look anywhere. No more spending $7 a lb for organic greens at the grocery store. Micro greens are very pretty if you get a mix and reseed regularly. Salad bowl mixes are a good choice. You can change up what you plant season to season to keep food on the table and things looking nice. Basil and some other herbs are expensive to buy but easy and cheap to grow and oh so pretty. The sky is the limit to the different types of herbs you can grow in a lot of places. Leeks are $ 3 per lbs where I live and they are simple to grow and will even winter over. Giant Mussel borough leeks are very cold hardy and easy to establish. 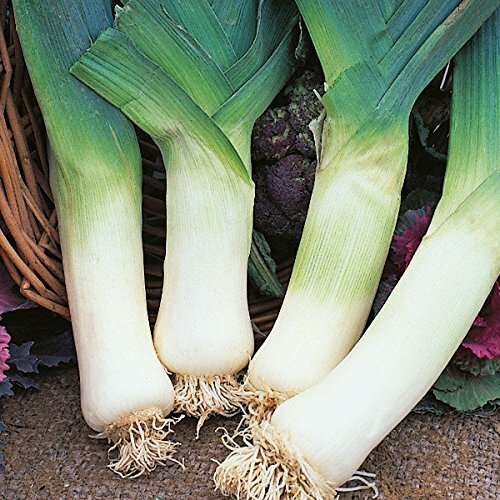 You can start eating leeks when they are very small to thin them out and make room for the larger ones to expand. They can get to be a few inches in diameter if left alone. Eventually, they will go to seed and you can collect the seeds. I love these because they fit in just about any space. You get a lot of apples off such a small tree. 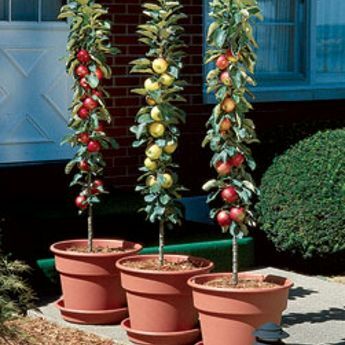 These are good to use for hedges and can even be used for container gardening. They make a great gift for anyone that has even a balcony and wants to be more self-sufficient! Maximum height is about 10 feet but you can keep them trimmed to a lesser height if desired. These types of trees have so much potential. I am considering getting some for borders around where our winery building will hopefully be. Draw out your space. You can use county GIS records even to get a general idea of shapes on a larger scale. Even just a rough sketch can help you out when it comes to figuring out what spaces you need to fill and then plan out how you are going to arrange your plants and fruits. There is no one that is going to tell you that you have to plant things in a certain arrangement. You might have several patches of garlic for example in different areas of your place. Lots of variation can be quite beautiful. 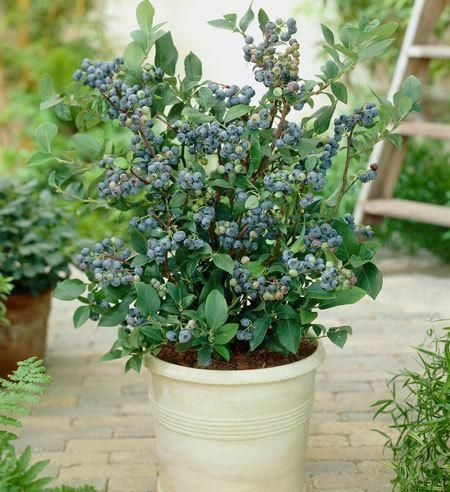 Blueberries will grow almost anywhere. Low bush cranberries like it a little cooler. With so many varieties being created, I advise looking at some suppliers and seeing what is available in your USDA Zone. Blueberries are a high dollar fruit. At the grocery store, they go for $3 a pint in season. Kids love to go out and pick berries and they are very high in antioxidant levels so they make a good healthy snack and encourage being outside! Hazel Nuts, pecans, walnuts, etc all come from trees and bushes that you may be able to grow. We are a little too cold where I am to grow pecans unfortunately but they are sure a pretty tree. 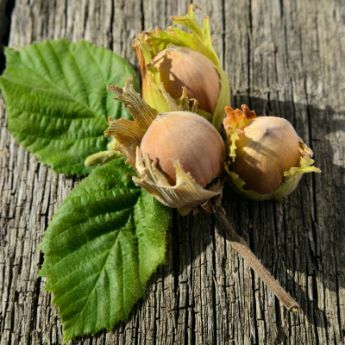 Hazelnut trees can even be inoculated with Truffle fungi so you can sometimes get a gourmet delicious treat. There are plenty of people that grow lbs and lbs of delicious mushrooms from lawn clippings and other green mulches or wood chips. Mushrooms can accumulate toxins so make sure that what you use is from lawns and spaces that have been kept to mostly organic principles. There is no way I would eat a gourmet mushroom grown near a place that had run off from a golf course or anything like that. I am of course partial to grapes for edible landscaping. We have 1600 vines but they are all cold hardy and disease resistant varieties. 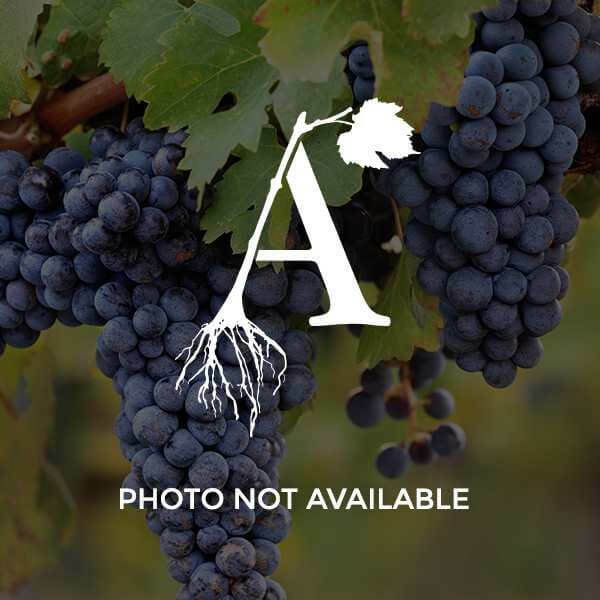 Unless you live somewhere that grows European varieties of grapes then I advise sticking to the French-American hybrids and American varieties to avoid disappointment or having to spray some pretty nasty stuff to get a crop. A few varieties I suggest looking into are America, Marquette, and Leon Millot. There are many others out there but these ones have great flavor. American appears to not require more than a light spray or two of organic fungicide and I suspect you can get a crop without spraying any in a lot of areas that don’t suffer very heavy rainfall. An arbor may be a very attractive and functional part of your yard. Arbors make great shady places to sit or have a porch style swing. Container gardening has a lot going on for those that are not quite settled or that rent. Containers can move with you and you can set them out into a permanent home when you find one yourself. I like to give options for everyone or at least give the tools needed to think about what can work in a given situation. When it comes to edible landscaping, the possibilities are plentiful. Converting land that has been heavily sprayed is doable. The amount an area has been sprayed is a factor in how many detectable chemicals are in the soil. This is one reason that to be a certified organic grow operation you have to be able to certify that non-organic amendments, pesticides, and herbicides have not been used for 3 years. A lot of places are never sprayed like that but since flower beds and other landscaping are if you move to a place and want to convert it is something to consider if you are really trying to avoid things like this in your food supply. Over spraying can lead to soil being devoid of earthworms and microbes that are good for growing foods. Luckily there are a lot of great options for getting things back into shape in little time. Organic fertilizers with beneficial microbes in it can be cultivated into beds. Composted manure from your livestock is another way to get this effect. 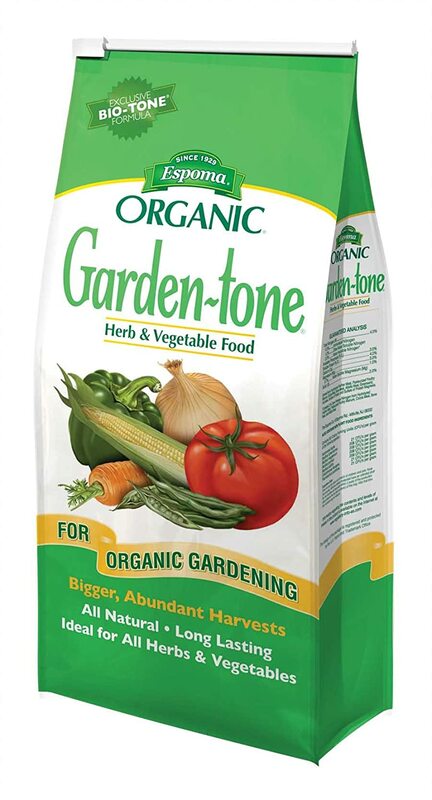 Garden Tone is an excellent way to inoculate dead soil with beneficial microbes and get your soil in healthy shape. Even if you are not dealing with a heavily sprayed soil type, giving your garden plants a boost can help get them off to a better start. Garden Tone is not the cheapest but you also don’t have to just use it. You can mix Garden Tone in with other soil amendments and it will still be a big help. Some of the times I have used it I have just thrown a handful or a little sprinkle in the area that I am planting. Amazon has a good price on this product at the moment. An old favorite with excellent customer service and warranties on what they sell. They have some very innovative offerings for all climatic zones. This is a great book for showing you how to establish raised beds around a property that are fertile and low maintenance.This is a great book for showing you how to establish raised beds around a property that are fertile and low maintenance. 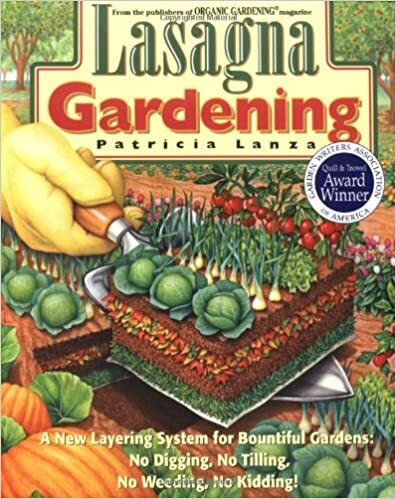 Patricia Lanza also has a companion volume on applying this concept to container gardening and very small garden spaces. Carla Emery’s classic book has an excellent gardening section. 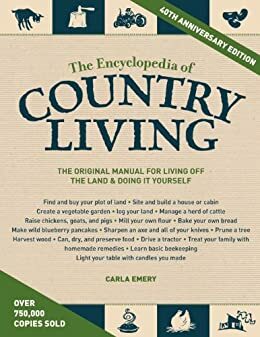 While you won’t find a ton of color pics in this classic, it has so many good ideas and information that it is a must-have in a prepper library. Check out the gardening section for “Earthchild Marie’s” garden designs for different seasons for some inspiration. The colder months are a great time to get started thinking about what you want to plant and do around your place. It can be a great comfort to some that get a bit down during the short daylight hours. While the internet makes online research and ordering a breeze, I kind of like getting catalogs in the mail and seeing all those bright fruits, veggies, and plants. It reminds you that Spring will eventually turn the world green and lush once again. Burpey’s Catalog is always fun because it is really big and colorful and looks old fashioned. They also have some great deals. Starting now also allows you to put in orders early so you can reserve your bulbs, plants, and trees to ensure what you want. Do you have any suggestions on edible landscaping? How did you design yours and do you rotate what you grow as the seasons change to get the most out of your space?